“I love you,” I said, and I’d never meant it less. I thought that was pretty good. I journaled, too – I’ve been doing that in a spiral-bound notebook, which is a switch from my typical composition book journal, but it’s allowed me to stretch out a bit and try some different things, cause my journaling can get stagnant. 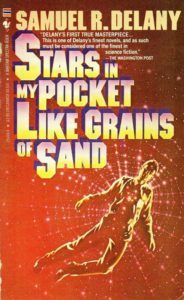 I’ve been very slowly reading Stars in my Pocket Like Grains of Sand by Samuel Delany. I got really into it at one point, and suddenly the curtains collapsed on the world he’d created and I realized I’d only been reading the prologue. And now I’m having some trouble following it but I’m still committed because the thing about Delany is, even when you don’t know what’s going on it’s still interesting. At any rate, I didn’t read any of it today, and I probably won’t, but I want to dip into it this weekend. I watched RuPaul’s Drag Race. I’m so bummed Valentina got voted off. I’ll be less interested in watching that show, now. Oh damn spoiler alert. Sorry about that.